Howard Bayley died in Norwalk, Connecticut, at the home of his brother Neville in 1920. His body was brought to the small town of Dauphin on the Susquehanna River for burial. His funeral was held Tuesday morning at 10 o'clock, the Reverend P. H. Hershey, Pastor of the Presbyterian Church, officiated,and the Knights Templar of Harrisburg, had charge of the services at the cemetery. 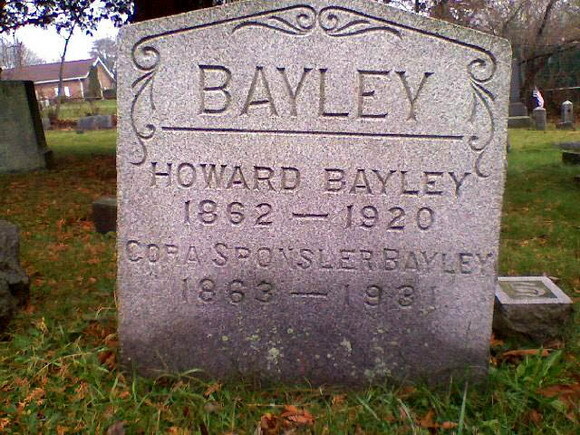 Cora Sponsler Bayley died in 1931 and was buried in the town where she was born. 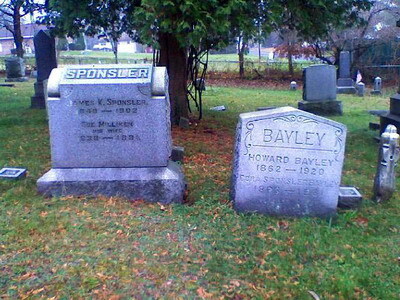 Howard and Cora Bayley were buried next to Cora's parents, James K. and Sue Milliken Sponsler. Cora's father's dates are 1848-1902; her mother's dates are 1838-1881. Photographs thanks to Tom Arnold, Rootsweb Message Board for Dauphin County, Pennsylvania, November 2008. Used with permission.